My colleague Allen was doing an Exchange 2003 to 2010 migration today, and things were not going well, mail refused to flow from the Exchange 2003 server to the Exchange 2010 server (it flowed from 2010 to 2003 without error). During migrations that’s not unusual, and removing and recreating the routing groups usually fixes it, but he had done that. 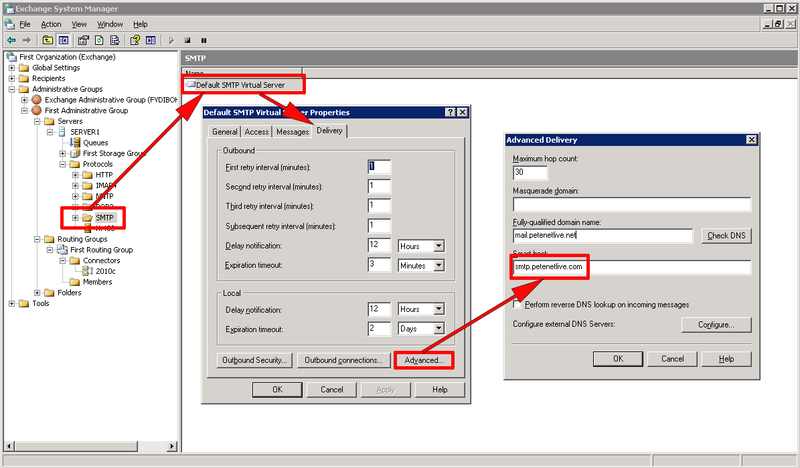 Mail was sat on the Exchange 2003 Server outbound queues on the queue that matched the routing group connector, but refused to move with the above error. For about 45 minutes I was also scratching my head, but then I had a brainwave. If Exchange 2003 has a ‘Smart Host’ Configured on the ‘Default SMTP Virtual Server’ then it attempts to send traffic down the routing group via the smart host, (which will obviously fail). Remove any entry from the smart host section. When done, restart the SMTP Service, and the Exchange Routing Service, and the queues should start to clear.